This fun snowman art activity will delight you and your child. My daughter loved pulling apart the cotton balls for this activity. Of course, she loved gluing them on too! Snowman craft activities encourage learning and exploration even during the winter months. You will already have most of the supplies for the cotton ball snowman project. Don't forget to check out the teaching tips after the project directions. The tips will help you expand this winter activity into a complete lesson for your child. It's so much fun and very rewarding to teach while having fun. Have fun creating and learning and of course enjoying your child. Remember...when creating with your child let them take the lead. Let your preschooler create in their own special way. This will allow them to develop their creative side which is a necessary skill for problem solving. Help them when needed of course, but do not take over. Yes, this can be a hard skill to master and I remind myself to do the same when I sit down to a craft project with my own child. As with most of our project pictures, this is what my 2 1/2 year-old produced with very little direction from me. 4. Use embellishments or markers for eyes, nose, decorations, etc. 2. Expand language by introducing concepts of hard and soft. You can go around your house and find hard and soft things. 4. Discuss the color white and find other white objects. 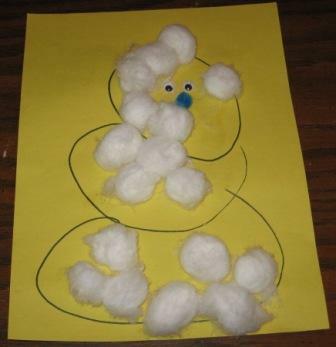 Did you enjoy our cotton ball snowman activity...consider subscribing to our free E-zine. Get valuable subscriber only information and ideas right in your in box.